[154 Pages Report] The overall data quality tools market is expected to grow from USD 610.2 Million in 2017 to USD 1,376.7 Million by 2022, at a CAGR of 17.7% from 2017 to 2022. The advent of technology is a major factor resulting in data explosion. Furthermore, the fall in gadget prices, the increasing accessibility of users to smart devices, and powerful computing tools have contributed to this rise in data. The ever-expanding amount of data has led to complex data types and formats, thus understanding and evaluating the information from this collected data for rapid actionable decisions is expected to drive the growth of the data quality tools market. The base year considered for the study is 2016, and the forecast has been provided for the period between 2017 and 2023. The health and life sciences vertical is expected to grow at the highest CAGR in the data quality tools market during the forecast period. This vertical is expected to leverage the benefits of data quality tools substantially. The vertical has always been overloaded with data, chiefly from patients, clinical, claims, hospital systems, financials, pharmacies, and most recently from wearable technology sources. The vertical is pushing toward generating electronic health records and periodically updating the reporting methods and data storage. The federal government is offering incentives to hospitals to trade off-paper medical charts with electronic health care records. With the records of the patients being captured digitally and stored on-premises or on cloud, any vulnerabilities in the data can be potentially hazardous. Thus, adopting a robust data quality program is vital for this ever-growing vertical. During this research study, major players operating in the data quality tools market in various regions have been identified, and their offerings, regional presence, and distribution channels have been analyzed through in-depth discussions. Top-down and bottom-up approaches have been used to determine the overall market size. Sizes of the other individual markets have been estimated using the percentage splits obtained through secondary sources such as Hoovers, Bloomberg BusinessWeek, and Factiva, along with primary respondents. The entire procedure includes the study of the annual and financial reports of the top market players and extensive interviews with industry experts such as CEOs, VPs, directors, and marketing executives for key insights (both qualitative and quantitative) pertaining to the market. The figure below shows the breakdown of the primaries on the basis of the company type, designation, and region considered during the research study. The data quality tools market is led by software and service providers, such as Microsoft Corporation (US), SAP SE (Germany), IBM Corporation (US), SAS Institute Inc. (US), Oracle Corporation (US), Informatics Corporation (US), Experian Data Quality (US), Tamr (US), Pitney Bowes (US), Information Builder (US), Talend (US), Trianz (US) and Syncsort (US). These Data Quality Tools Software Vendors are rated and listed by us on the basis of product quality, reliability, and their business strategy. Please visit 360Quadrants to see the vendor listing of Data Quality Tools Software. In May 2017, Informatica launched Informatica Data Governance & Compliance. This is the industry’s first data governance solution built particularly to strengthen enterprise data governance and compliance. The Informatica Data Governance & Compliance solution will help enterprises in engaging their IT and data security teams for governing all data types, such as cloud, on-premises, and big data. In March 2017, Trillium Software, a Syncsort company, launched Trillium Precise, a data-as-a-service solution that offers a single view of customers enabling accurate, verified, and complete real-time data. In February 2016, Information Builders launched the iWay Hadoop Data Manager to provide Hadoop-based data integration and management. The solution offers an easy-to-use interface that is instrumental in generating portable and reusable codes for Hadoop’s data integration tasks, such as data ingestion, transformation, and cleansing. What are new application areas which the data quality tools companies are exploring? The overall data quality tools market is expected to grow from USD 610.2 Million in 2017 to USD 1,376.7 Million by 2022, at a CAGR of 17.7%. The increasing volume of business data and the need for improving the bottom-line performance through better customer engagement are the key factors driving the growth of this market. In today’s dynamic business environment, sustainability is the biggest challenge for every enterprise. With the substantial proliferation of data around numerous business functions, such as marketing, sales, operations, and human resources, the need to ascertain the quality of data has increased rapidly. Enterprises are investing heavily to harness benefits from the increasing volumes of data as well as to ensure the quality and continuous affordability to meet the customers’ demands. Eventually, these investments are crucial for improving the quality of data using data quality tools. The enterprises are encompassing data quality tools to improve the overall business performance and develop advanced business strategies to optimize the risk exposure to accelerate the growth and profitability. Machine learning has played a vital role in increasing the visibility and has also assisted in managing and improving the data quality. This, in turn, is driving the overall growth of the market. Data Quality tools market has been segmented, on the basis of data type, into customer data, product data, financial data, compliance data and suppler data. Financial data is expected to grow at the highest CAGR between 2017 and 2022. 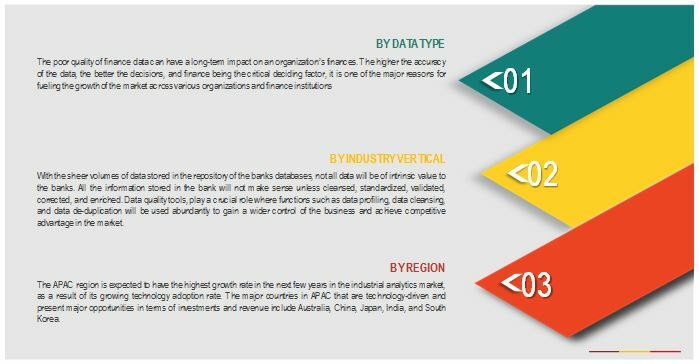 Financial data comprises sets of information related to the financial operations of a business. These sets of data are used by management to study business performance and identify whether there is need for defining new business strategies. The data quality tools market in APAC is expected to grow at the highest CAGR during the forecast period. 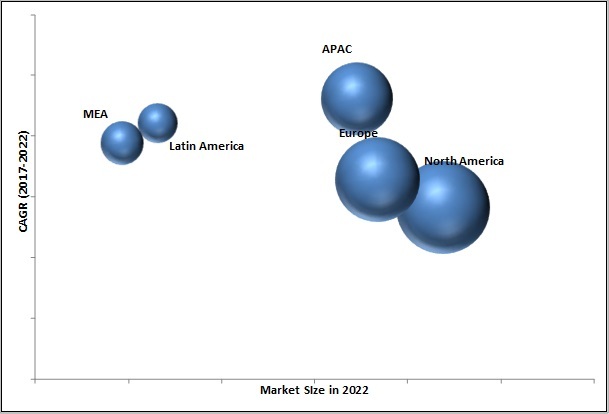 The APAC market has shown tremendous growth opportunities, especially in the regions of developing economies, such as China, India, and Bangladesh. With the growth of smart cities and proliferation of IoT devices, the region is expected to witness an ultra-growth in the future. Further, the start-up culture, the flexible government policies, the flourishing eCommerce business, and the spirit to deliver impeccable goods and services to every part of the world cannot be underestimated. Rather, it can only attest the unprecedented adoption of data quality tools and services in this region. The healthcare and life sciences vertical is expected to leverage the benefits of data quality tools substantially. The vertical has always been overloaded with data, chiefly from patient, clinical, claim, hospital system, financial, pharmacy, and most recently from wearable technology sources. The industry is pushing toward generating electronic health records and periodically updating reporting methods and data storage. The federal government is offering incentives to the hospitals to trade off paper medical charts with electronic health care records. With the records of the patients being captured digitally and getting stored on-premises or on cloud, any vulnerabilities in the data can be potentially hazardous, which triggers the growth of adoption of adoption of data quality tools in the market. The continuous rise of big data, growth of eCommerce, and increased usage of social media are a few of the drivers boosting the growth and adoption of data quality tools in the retail and eCommerce vertical. The vertical is generating unprecedented amount of data from social media, where consumers are openly sharing ideas and opinions with friends through numerous networking platforms. The data can be captured from these places, integrated together, analyzed, and valuable information can be extracted to meet customer demands, increase sales, improve business performance, and thereby have a differentiating edge over the competitors. The government sector thrives on a better data quality as well as data integrity programs. The industry is gearing up for advanced analytical applications, which is expected to give this industry real-time insight about the demography of the population. The data can be managed and analyzed effectively by government bodies to prepare effective campaign strategies. Infusing analytics in the application is expected to help the government in fixing the priorities of work and giving them broader insights of the development imitated and carried at the local level. Telecom companies worldwide are grappling with the unprecedented challenge of enhancing and maintaining the quality of their data assets to minimize revenue leakages and reduce their process failures. The latest predictions from CFCA 2015 Industry Survey reveals that telecom operators globally incur an average loss of 13% or USD 294 billion due to numerous uncollected revenue and frauds prevailing in this industry. Poor administration of back office database clubbed with inefficient data quality tools are the major reasons for bringing such upheavals in this industry. Adopting data quality tools could help CSPs to identify, cleanse, and enrich their in-house generated data using data-deduplication tools. Clean and enriched data provides better insights to comprehend customer’s demand which could be capitalized by offering customized services ensuring customer retention and establishes higher brand loyalty. What are the upcoming industry applications for data quality tools? Lack of awareness is a major factor restraining the growth of the market. Enterprises with a large number of employees have been adopting advanced solutions to enhance their performance, considering the large pool of data available with these enterprises. Enterprises are aware of the poor quality of data and understand that bad data could have a negative impact on their performance, revenue, sales, and profits. However, many organizations still adhere to traditional time-consuming and tedious methodologies, such as manually rectifying the errors present in the data. This can be majorly attributed to the lack of awareness of the availability of new technologies in the market. According to a survey carried out by Experian, almost 53% of the companies prefer manual methods for data cleansing to that of automated methods. This includes reviewing of data manually on Excel. The absence of a centralized strategy for maintaining data quality is another factor restraining the adoption among businesses. Key players in the market include Experian Data Quality (Experian Plc) (US), Informatica (US), Information Builders (US), IBM (US), Microsoft (US), Oracle (US), Pitney Bowes (US), SAP (Germany), SAS Institute (US), Syncsort (US), Talend (US), Trianz (US), and Tamr (US). These players are increasingly undertaking mergers and acquisitions, and product launches to develop and introduce new technologies and products in the market.